It won’t pass coast guard standards, but a sealed up five gallon bucket makes a passable flotation device in a pinch. 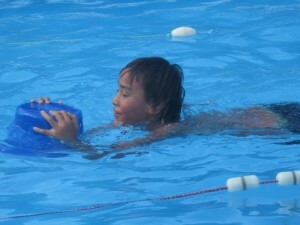 Here’s a kid learning to swim using a personal flotation bucket. You could expand this idea to make a buoy or a raft. One man took this idea to the extreme by building his own private island held afloat by plastic containers.